Description: Camp Meeting Ave, 1906 hours. Description: An m.t. grain train struggles up Raccoon Mt near Wildwood, Ga. Description: A quick grab shot of a rerouted Q698 moving east through the evening twilight. The long way around for this Cincinnati- Hamlet, NC train. Description: 8579 waits for a signal on the ICE with an empty westbound ethanol train. Description: Two lovely YN3 SD50's slide by the classic Bluffs at Hoffman Ave. Soon this landmark will take on a much different feel, as the BNSF and CP work to bring down the signature signal bridges at Division St, and not too far off Hoffman Ave. Description: Even though this shot is one of the more cliche spots in Saint Paul, I couldn't really pass it up considering what was to roll across it. Description: Dodging the clouds, the two SD50's look terrific in late afternoon sun. Description: The last shot of the day was at this nice opening next to the King of Diamonds. It was nice to find the searchlight signal still hanging on. 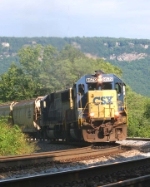 Description: CSX Q381 crosses Pump Rd located at QC 308.96 on the CSX Rochester Subdivision with 30 cars and two EMD standard cab locomotives running elephant style for power. The train had a clear signal at CP 308. Description: Q301-10 moves west through Woodbourne with CSX SD50-2 8579 and CSX SD40-2 8315 pulling a small 120 or so axle train.